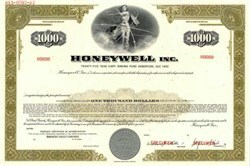 Beautiful engraved specimen bond certificate from Honeywell Inc. printed in the 1960's. This historic document has an ornate border around it with a vignette of a woman surrounded by electrons. Honeywell NYSE: HON is a major American multinational corporation that produces electronic control systems and automation equipment. It is a major supplier of engineering services and avionics for NASA, Boeing and the United States Department of Defense. The company was founded by and named after Mark C. Honeywell, a pioneer in automation technology. Honeywell is traded under the ticker symbol HON on the NYSE with a market capitalization of US$30 billion (2006). The company is part of the Dow Jones Industrial Average Index.